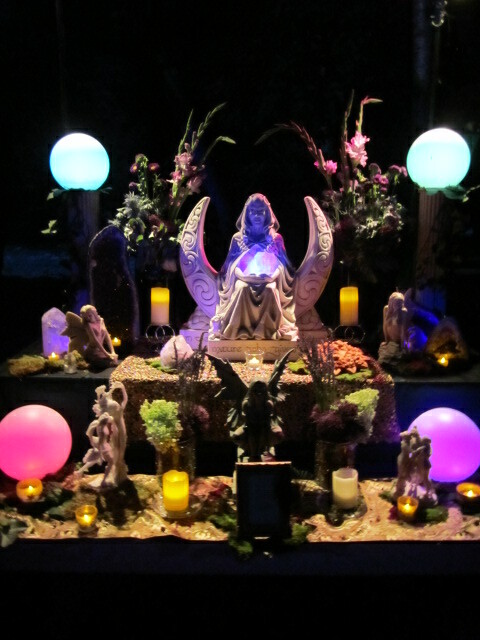 Altar by Living Fae. Flowers by Intrinsic. Photo taken at Sunset Campout 2011. Affirmation: I am aware of my exceptional life. No matter where I am, I see and feel it in all its perfection. I am in love with my amazing life. What I found was that whenever I said Happy Friday to someone it was returned with a huge smile. Whether is was the lady standing solemly at the bus stop who said, “Hey Baby!” back to me, or the homeless man digging through the garbage who told me to “Have a great weekend!” It always came back with a big smile. A smile I didn’t see before I said it. And seeing them smile really made my heart feel all warm and fuzzy. Then this morning my yoga instructor greated us with, “Happy Saturday!” Coincidence? As far as I’m concerned there is no such thing as a coincidence. I believe its a lesson in Law of Attraction. What we put out there comes back, and the universe likes to show us in a variety of different ways. We just need to be aware in the present moment. If you know about “The Secret” you know about The Law of Attraction. I knew about the Law of Attraction long before The Secret though. It was something I learned through my spiritual studies over 20 years ago. What I can tell you is The Law of Attraction is a universal law and it does work. So be sure to stay conscious of your thoughts and feelings. Take notice of what you are thinking when you are feeling certain feelings and vice versa, because the universe doesn’t place judgement, it just responds according to the combined energy and the power behind that energy. What do you want to attract in your life? Remember you have an amazing life. Start with the awareness of recognizing you have it and the rest is just about simmering the ingrediants to perfection. With love, light and faerie dust! This entry was tagged affirmations, happiness, Intrinsic, Law of Attraction, life, Living Fae, love, self help, spirituality, Sunset Campout, The Secret. Bookmark the permalink.